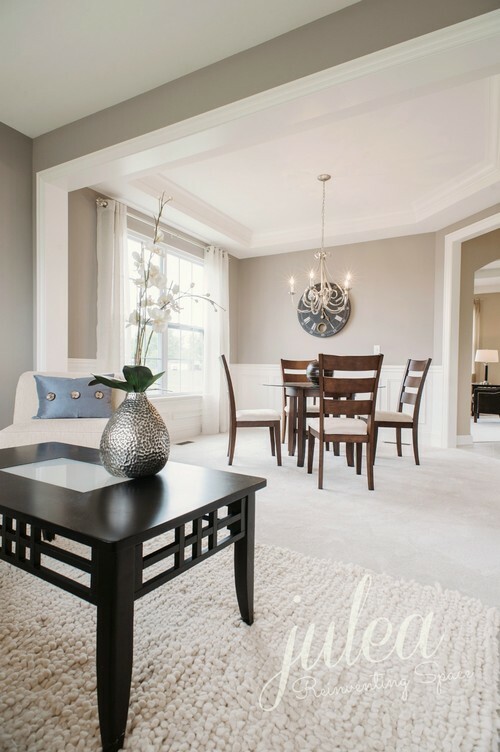 The gray paint trend is still going strong, and I am often asked about my favorite light gray paint colors for walls. In this post, I’ve rounded up some of my top choices from both Benjamin Moore and Sherwin Williams. It’s very important to read through the descriptions so that you can understand the undertone of each color and how it might work in your home. The other day I did a consult with a client to select paint colors for her open living room / dining room / kitchen. The home had been a builder spec home in a new development, and the client had re-painted when they moved in but felt the color, which was a very cool blue-gray, wasn’t quite right. Her instincts were right, and I could definitely see how she’d had trouble selecting the right paint color. The builder had used a pretty stone on the fireplace with warm gray undertones, tan carpeting, medium dark wood floors (not too red, which was good), espresso colored cabinets, and then granite countertops that were mostly gold with flecks of burgundy. The fixed finishes were all over the place, and the gray they’d picked was too cool to coordinate with any of them. I brought my Sherwin-Williams and Benjamin Moore paint decks along with loose swatches of some of my favorite colors. I also brought drafting tape and a piece of white foam core. I like to tape the loose swatches to the foam core and then move the foam core around the room. Plus, the white of the foam keeps the existing wall color from distorting the color of the swatches. We eventually settled on three options for the living area that were all warm grays and then three options for blue-greens in the kitchen and dining area. We discussed painting the cabinets ivory to better coordinate with the cottage style the client prefers. These are my go-to, warm, light gray paint colors and my starting point in just about any room where I know I’m not doing a color or a beige. 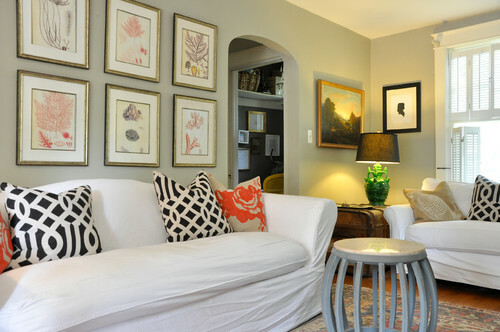 Agreeable Gray by Sherwin Williams is definitely one of my top favorite colors for walls. It’s a warm stony color right in between true gray and beige. The undertone of the color leans more towards yellow-orange than toward green. I know that everyone (on Pinterest) is loving Revere Pewter these days and with good reason. This is my top contender for my client’s living room because it paired nicely with the stone in her fireplace. It’s got a little more pigment in it than the Sherwin-Williams light grays (second swatch down on the strip) and has a more yellow-green undertone. I used Revere Pewter on the board and batten wainscot in my modern farmhouse bathroom remodel and paired it with Benjamin Moore Balboa Mist on the drywall above. Worldly Gray is cooler than Agreeable Gray with more green in the undertone. It’s a beautiful color that looks lovely with natural wood. Edgecomb Gray is right below Revere Pewter in the Benjamin Moore paint deck, but Edgecomb Gray has more yellow in it than Revere Pewter and less pigment. It’s a wonderful alternative to beige and much more versatile. Useful Gray has a yellow-green undertone to it and also looks great with natural wood. It’s light and fresh feeling. Stingray also has a yellow-green undertone. It’s another beautiful versatile gray that’s neither too warm (beige) or too cool. Sedate Gray is probably my all-time favorite gray. It’s definitely a green undertone, but it’s still warm. It doesn’t tend to look sagey, and it works well with all colors of natural wood. I have used most of the colors from the same paint strip and find that they are somewhat changeable with the light, looking cooler or warmer depending on the time of day. It also looks really beautiful with marble. 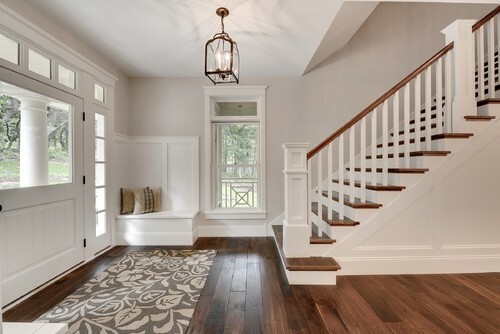 All of these grays work really well for rooms with lighter hardwood floors and for rooms with wood trim. If you prefer darker colored walls or just a little more pigment than these light grays, you can always use the third swatch down on the Sherwin-Williams paint strip or the fourth or fifth swatch on the Benjamin Moore strip (for the non HC colors). I like to use the lightest color on the strip for the ceiling instead of stark white. I hope you found this post on my favorite light gray paint colors helpful. If you’re local to the Des Moines metro area and need help picking out the perfect paint color, call me today to set up a consultation. Lighting is EVERYTHING. In my home, Agreeable Gray actually appears to be lighter and cooler than Worldly Gray. The photos shown here of Worldly Gray look more like Agreeable Gray….and the photos of Worldly Gray look like Agreeable Gray (in my house anyway). Yes! I was just at a client’s home. We were testing out Revere Pewter in their living room. On four different walls, it looked like four different colors because of how the room received natural light. It was also complicated by the original wall color, which is why I like to always look at colors on a white background if possible. What is your opinion on SW Amazing Gray with honey oak? Its on the same swatch as SW Wordly Gray. Does being on the same swatch mean that colors keep the same undertones? I think it would be fine. If they are on the same swatch, then they have the same undertone, so it will work. Interestingly enough, I just considered that color for my home’s exterior. It’s a really great deep green-gray. What wall colors work well with light travertine marble tile? I would take a look at Benjamin Moore Manchester Tan. It’s a nice warm neutral. What gray/greige would look good in a teen girl’s bedroom that doesn’t get much light. The ceiling is 10 feet and average size room. Thanks! I think it would definitely depend on your trim color and also what sort of feeling you want to achieve. Some grays are cooler and some are warmer. Some look good with oak trim and some not as much. One color I’ve been loving a lot lately is BM November Rain. It’s a very pale luminous gray with a green undertone, and it looks good with both oak and white trim. It will appear more like a white than a gray. If you want more pigment, I might try Sherwin Williams Wordly Gray, which is a warm gray but still light. It’s possible it could work if it were a warmer gray/greige with bronze or brown undertones. You definitely want to stay away from cool greys with blue undertones and probably even the warmer grays with green undertones. I would take a look at SW Agreeable Gray and also BM Edgecomb Gray. I can’t be sure that they will work though without seeing the tops in person. What “greige” would you recommend for a two story great room. The room is west facing and we are using Sherwin Williams. Hi Lisa, it’s really difficult for me to say without seeing all of the other elements in your space. I would select a few of the colors I’ve mentioned here and paint large swatches onto poster board. Put them up in your room and observe them in the morning and then in the evening. That will give you a better feel for how the light will effect the color in your space. Hi! I have and love samples of many of the colors above. I’ve been trying to decide for the past three months! Problem is, my kitchen has lots of golden oak tones in the floor and the Alder Cabinets :/ I am trying to decided between BM Edgecomb Gray and BM Wind’s Breath. Would one mesh better with all the gold tones in my wood? Thanks so much! I think it depends on what color your trim is. I am not familiar with Wind’s Breath, but Edgecomb, to me, can go the slightest bit pink sometimes. If your trim is oak, I’m not sure I would go that direction. I would look for a gray with a little green in it like SW Agreeable Gray or Sedate Gray. It’s really hard for me to say without seeing your space, so take this advice with a grain of salt. Lighting and other finishes can dramatically affect the color. Hi Beth, it’s hard for me to say without being in your home, but I have always liked Sherwin Williams Tidewater and Seasalt. Im having the hardest time with our family room. We have golden oak floors and it has a darker warm brown with blackish brick fireplace right smack in the middle of the room. The room was painted edgecomb gray when we moved in but really pulled a yellow from the floor. (we have the same colour in the living/dining room and its way more gray and i love it there!) The sofas in the family room and curtains are all taupe/greige so the brick really stands out. 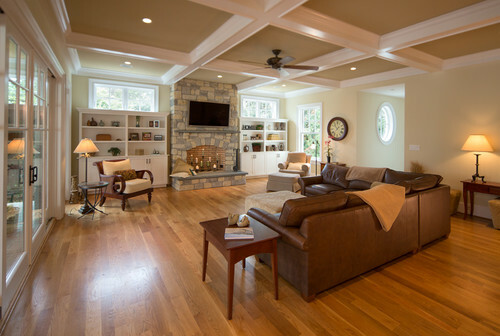 To complicate matters its a sunken family room and is open to the rest of the main floor thats already neutral. I painted it a nice rich medium blue (oarsman blue behr) which looks great with the furniture and fireplace and gold frame accents… But stands out like a sore thumb against the rest of the main floor. I think i need to go back neutral and bring colour in the accents but cant decide if i should go lighter or darker… Revere pewter or Ashley gray. Any thoughts would be hugely appreciated and hopely save multiple repaints! I just updated my wood floors to a beautiful espresso stain and kept my maple cabinets. I have an open kitchen living area and the home has moulding that is now painted white to showcase it. Like your client, my living room has a stone fireplace and my granite has flecks of Black and Tans and my appliances are Viking stainless. Today my walls are SW Passive and the room is full of light with large windows. My sofa is a Henerdon sectional with a very light peach cast. What paint would you recommend that would be stunning? Loving all of these grays. I would love some advice because I’m having a very hard time choosing a color to paint my cabinets. My walls are French White by Benjamin Moore. And I was thinking of painting my kitchen cabinets with Ashley Gray by Benjamin Moore. But I want to make sure it still looks warm. I have white appliances and white trim. My kitchen is somewhat open and higher ceilings. I get a good amount of natural light during the day and then mid-afternoon things start to darken up which makes all the colors change. I would so appreciate some advice. It really is a trick to find the perfect gray to go with all the fixed elements. And sometimes, there is no one perfect color because those fixed elements are so discordant. Glad you found one that works for you! I love all the grays you suggested! I am having a tough time finding a warm gray for my open floor plan house (currently painted an awful gold-beige-green color), and hope you can help me with a question about undertones. The floors are light maple and cream carpet (both have pinkish undertones). Should I look for a gray with a pink undertone, or would that make the pink worse? I really don’t want a pink or purple house!! 🙂 I have tried Agreeable Gray and Edgecomb Gray and both looked pink. I’ve also read to stay away from yellow undertones as they would make the pink undertones look dirty. I’m thinking of picking up a sample of Worldly Gray tomorrow and hope it’s the “One”. What do you think? I would love some advice in selecting a wall colour. We have fir floors throughout our home. They have an orange tone with slivers of a warm creamy yellow throughout. Our kitchen cabinets are white and we have a used brick fireplace with grey mortar. Our wall colour is BM French Vanilla (now called Papaya I believe) but we would like to update it. We are considering a white, cream or warm gray wall colour. Can you recommend a colour? Would SW 7030 Anew Gray work well with an espresso floor in a finished basement with white trim? Agreeable Beige and Gray look too light. I have 2 windows and good lighting with several can lighting in my ceiling. We’re trying to pick a light gray paint for our open concept area. Our floors are dark wood, all windows are white shutters and kitchen cabinets are white. The kitchen granite is creme bourdeux and it’s also around the fireplace. Suggestions? ? Hi Jillian, I love all of your comments and ideas. Which grey would you recommend for a bedroom? I have white oak trim (unfortunately) and very minimal natural light. The carpet is a neutral beige and my furniture is a driftwood color. I want something calming and subtle but still noticeable. I was thinking SW agreeable grey but am having a hard time coordinating the various wood colors. Thanks in advance! I am looking for a grey that looks great on my exterior next to antique brick. It has been very hard to say the least. We have stucco and verticle farm board. My dove white looked yellow, my edgecomb grey looked medium tan and leading the pack is the agreeable grey which is in most of my interior. I am worried it will pull blue though. Do you think agreeable grey is good outside and with antique brick? Thanks and appreciate any input. I have had out 3 color specialists and can affort more. Ha! Going to do a fix and flip in Atlanta suburb..1900 sq ft ranch.. Planning on agreeable grey for walls..looking for suggestions on cabinet color..currently old fashioned stained oak. I was thinking of Dorian grey and Santa Cecilia light granite .. Thoughts ??? Benjamin Moore White Dove (OC-17) is my go-to trim color. Sherwin Williams Incredible White might also look good with Dorian Gray. Love all the colors you posted about! Fantastic job! I have my heart set on a gray paint scheme for our new house, but it is best described as post and beam style with lots of light, natural wood. How do you think the revere pewter would work with this? Is there maybe a better choice? I think Revere Pewter works well with natural wood. I’ve specified it several times in spaces with oak trim. Jillian, I have Brazilian cherry floors throughout my entire house and limestone in the kitchen and main hallway. I love Edgecomb BM would that work for me? kitchen cabinets are cherry but not too red. Edgecomb has the tiniest bit of pink in it, so I think it’s worth a shot. As always, paint some test swatches in various locations…one close to the limestone, one close to the cabinets. Try to paint them on different walls so you can evaluate them in different light. This post has been so helpful. I’m looking for the right gray to use throughout my home. It is north facing and doesn’t get much natural light so I’m worried that this will pull out the undesired undertones while I am hoping for a true gray. I am planning on testing out Useful Gray, Edgecomb Gray, and Agreeable Gray, do you think one of them may be better with the lighting of my home? Or another color entirely? Thank you!!! Hi Christen, it’s really hard to say without seeing photos of swatches, etc. Edgecomb can pull a little pink, which may counteract the coolness of the northern light. The best thing to do is just paint swatches on the walls in different areas of your home. 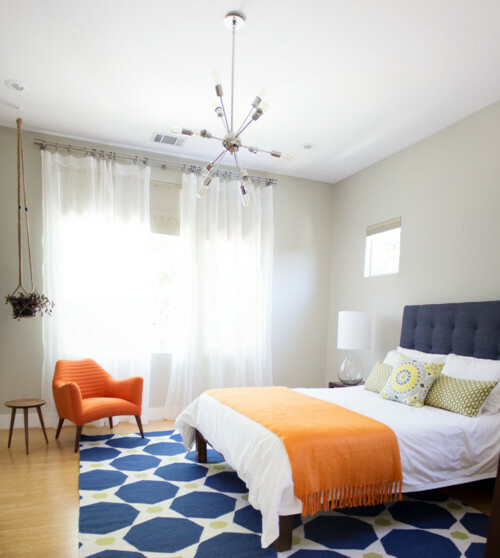 You might find that some rooms are going to need different colors to look their best because of their exposure. We are finishing our basement with dark floors, cedar and stone wrapped columns, dark cabinets, and light creamy granite with caramel colored specks through it. I picked agreeable gray for walls but having trouble with trim. I want an off white color for trim but don’t know which is the darkest off white I can go. Benjamin Moore White Dove is my go-to trim color. It’s a little creamy with a touch of gray. You can see the difference if you hold it up next to a stark white. Hi. I have walnut colored hard wood floors,gray quartz & quartzite countertops, and cararra marble backsplash. My wall color/trim/cabinets are builder off-white (not cream)and lot of bright blue and red accents. I’ve used a lot of grays, but I’m looking for a gray for two accent walls with slightly/undectable blue undertones that will complement the decor and hopefully make the builder off-white look more white. Any suggestions are greatly appreciated. Hi Pamela, I tend to stick to the warmer grays or grays with warm green undertones because the blue grays tend to look so cold. You could take a look at (all Ben. Moore) HC-170 and OC-52. I am going with Agreeable Gray in our open family-breakfast/kitchen area (north) and huge 2 story entry (@25% lighter due to low light) and dining room. The floors are dark hardwood in all of these areas, earthy stone fireplace (creams/greys/little brown/orange) kitchen cabinets med/dark oak and santa cecilia granite (gold/grey/dark flecks). BM Simply white was too stark for the trim/ceiling. I’m planning to test your “go-to” White Dove. It will be used for trim and plantation shutters. Do you have a different suggestion? What do you suggest for a ceiling color? Would white dove work well for crown and ceiling? I think White Dove is a really good choice because it’s got a touch of gray and a touch of cream. It won’t read as stark white. You could also do the White Dove in flat on the ceiling, which is pretty, or you could use the lightest color on the Agreeable Gray strip, which will make your crown pop out but still coordinate. Your post and replys have been very helpful! Hoping you can help me with few questions. We have 20ft entryway and very open floor plan and will use a color throughout most of first floor expect laundry, first floor guest bedroom/ bath and master bedroom/ bath with white stone with little gray in it. I really love SW requisite gray that i painted on the wall but afraid it is going to be too dark. I am thinking about Agreeable gray or Repose gray as an alternative. Also have coffered ceiling in dining room and wanting to use a darker color within coffered ceiling trim. Any suggestions in using Requiste gray at 33% or 50% or any other color suggestions? I plan to use white dove on trim and ceiling. Jillian, I have sedate gray on my walls in my open living, dining, kitchen and would like to paint my kitchen island? I want something that will go with my walls. My floors are a clear white oak and kitchen cabinets are a natural wood tone. Thank-you so much for your time/suggestions. We are painting our dining room useful gray (SW) and would like to use a metallic treatment, such as tin, in the pan of the ceiling. We have dark oak floors and Delicate White (PPG) trim. I’m contemplating using SW Useful Gray as my trim color through my whole house, do you think it’s too dark? My rule of thumb is to use the lightest color on a strip for the trim, second lightest (or first) for the ceiling, and third for the walls. And, of course, the walls can go darker. This gives a nice soft effect. I can’t really say if Useful Gray is too dark because I don’t have any information about the house, but it will definitely not read as white. I wanted to attach a photo of what the room & what I meant by trim/wall making up most of the color but I don’t see how to attach a photo? Hello! I love all you color selections! I am trying to paint my whole house in different grays. My foyer is painted with repose gray and I am trying to choose another gray for the living room (which will actually be a piano room) which is right off of the foyer. I wanted to use a slightly lighter shade or maybe even something along the same lightness of repose grey. We have medium wood floors, white trim and will be putting a dark wood baby grand piano in there that also has a brown leopard print fabric bench. Any help would be appreciated! Also, any general tips to make choosing a grey paint colors for the rest of my home? There are soooooo many choice and it is very overwhelming! It’s a really nice color, and I think it should work well. But, it also depends on the color of your trim. If it’s painted white, you should look at the two whites together and make sure they don’t make one took too green, too pink, etc. My wife doesn’t want something depressing and dreary and i don’t want too light that I might as well have white (lol) any suggestions? Thank you!!! Hi Chuck, I’m glad you found this post helpful! City Loft isn’t a color that I’m familiar with off the top of my head. It looks like it has a warm creamy undertone to it with a touch of gray, which will contrast with the white cabinets. If you can go with Benjamin Moore instead, I like Revere Pewter (more gray-green) and Edgecomb (lighter and beigier) as my go-to neutrals. It’s really hard to give good color advice online though because it’s so important to understand the finishes and lighting in the actual space. I would also paint lots of swatches on multiple walls and look at them at different times of day. I think we should look at Revere Pewter as a possible main color. Edge comb is pretty too, as is Worldy Gray. It will depend on the stone for the fireplace and the kitchen counters since they are open to each other. I am in the process of paining my home, the painter is waiting on me to pick colors. Currently have gold.beige walls. Floors are medium colored hardwoods, kitchen is done in tan tumbled travertine tiles with Santa Cecilia granite. Which is the best gray for the walls, SW Agreeable Grey or SW Front Porch. We have some rooms with natural light and some rooms are very shaded with no direct light. Hi Pam, unfortunately, I can’t give specific color advice. Color is so subjective and heavily dependent on the other elements in the room that you mentioned as well as the light. I would really need to be present in the space to give you advice I would feel confident in. Great article! I’m currently building and trying to decide on paint colors. My builder uses SW paint and I really like Agreeable Gray. I do have a concern though. I went with Merillat Chiffon (off white) cabinets and I’m not sure if this paint color will make them look yellow. I would love to hear your opinion on this! Do you maybe have a different color suggestion for me? Thanks in advance! I have a kitchen and trim with the yucky honey oak old fashioned cabinets. What is the best color for the walls? So desperate to find something! Jaime, a green-grey could work really well. You definitely have to test any color out. Like SW Worldly Gray. Another non-gray to try might be BM Manchester Tan. Hi Jillian, Love your blog! I have a good eye for color normally and my husband says I take “too long” to pick one out! We have med tone MCM wood pieces in our bedroom and just repainted it today with BM Edgecomb grey.. love it! Its soft and we got the matte finish, now the problem is to pick a trim color for baseboards, windows and door that are not the normal bright semi gloss paint that is already there. I want to bring in a subtle grey to complement it, any suggestions? Should I go a tad darker or lighter? After that we are going to tackle taking down a whole bunch of white on white wallpaper and do the rest of our ranch another grey. I could send you a pic of that room so you could see the coloring ;o) I want that same color to go from the hall into the living room. thanks so much! Hi Linda, thanks so much! That’s a tough one. Edgecomb is a really changeable color, and it isn’t on a strip in the BM fan with other like colors. For a question like this, I would probably have to get out my paints and really think about it. I’d be happy to set up a call with you if you like. Or I know for sure that Carla Aston is an interior designer who is set up to provide online color advice. 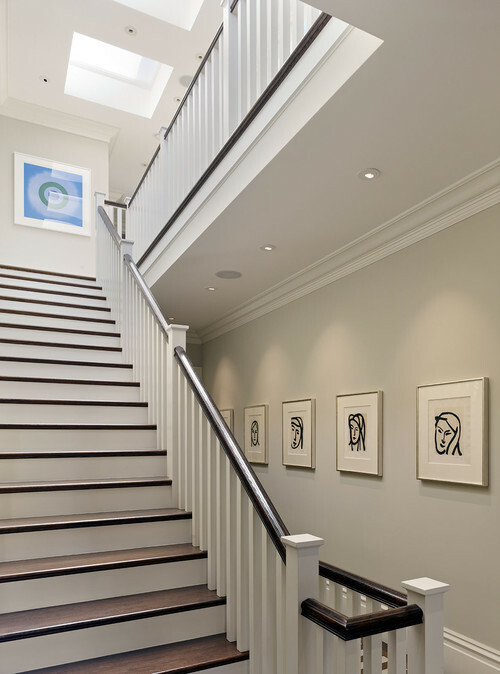 1- If I were to do Worldly Gray in my foyer, what finish would you recommend to avoid scuffing with children’s bags. Would you recommend this for a front foyer? 2- Considering Kendall Charcoal for my dining room. I want a dark gray, not black but something that feels rich. Have you used this color and would it work well in a dining room with mid century furniture?